Due to its location on the southern edge of the Malwa plateau, it makes an excellent tourist destination, during the day a cool breeze starts which makes the evenings quite pleasant. No wonder poets have deemed Shab-e-Malwa (the night of Malwa) exquisite beyond compare. Indore is spread out along the two small rivulets, Saraswati and Khan, which unite at the centre of the city where a small 18th century temple of Sangamnath exists. Thanks to the rich black soil of the Malwa Plateau, Indore has prospered into being the fourth largest centre of cotton textile industry in India. It is also justly famous for its beautiful bangles. Indore rose to prominence very late in Indian history. About the same as when the thirteen colonies were busy trying to wrest America from the tight grips of England, Malhar Rao Holkar, the founder of the dynasty, enters the stage of history. There is some debate as to where the Holkars came from. The most widely accepted view is that the family was of peasant origin and of the shepherd caste. They are said to have migrated from the area around Mathura in present Uttar Pradesh to a village called Hol, which is some distance away from Pune, in Maharashtra. The suffix 'kar' in Maharashtrian surnames is an equivalent of the German 'von' and the French 'du' – that is, Holkar means, 'of ' or 'from' Hol. Anyhow, Malhar Rao Holkar (1694-1766), by all accounts, was a hardworking self-made man and soldier. In 1724, the Peshwa (ruler) at Pune, delighted by his bravery and courage under fire, gave him command of 500 horseback soldiers and appointed him as his general in the important province of Malwa, with his headquarters in Indore. Later he was given the privilege of flying a triangular red and white striped flag which later became the ensign of the family. Reading between the lines one gets the impression that, as was very common in those troubled days without a waning Mughal rule at the centre, Malhar must have become too hot to handle in Malwa. The Peshwa might just have decided to appease him with increasing prestige and power. In 1733, the Peshwa finally gifted him the Indore area, effectively granting him ownership of a vast terrian stretching from the Deccan to Malwa. Inevitably, Malhar became independent of Pune's overlordship and by the time of the Peshwa's death, he became the ruler of Malwa. Though Ahilya never stayed in Indore it is under her reign that Indore began to flourish as a city. To this day she is remembered and revered in song and legend as a just queen known for her philanthropic and gracious disposition. Incidently, the weave of the famous maheshwari saris was introduced by her. In the confusion following her death, the commander of her armies Tukoji Rao Holkar of the same clan (though not a relative) seized power. Thus setting a precedent for his family, as his son Jaswant Rao in his turn seized power upon Tukaji's death. This kind of thing was very common in those days – the most wellknown of the power-seizers in India however came from a cold wintry island very different from the rich colourful land that India was then. However Jaswant Rao, it seems, had much better claims to the throne than his father. He was a brilliant soldier and leader. He had honed the famous Maratha guerilla warfare to almost an art form. After defeating the Scindias (of Gwalior) and the British commander Col. William Monson, he went on to lay siege in Delhi. His waterloo however came in Deeg and Farrukabad, where General Gerard Lake defeated him in November 1804. An year later he was forced to sue for peace. Unfortunately, this humiliation gashed the proud spirit of the warrior a bit too deep because soon after this he went insane. He died in 1811. 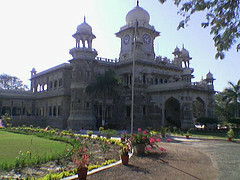 Under the British re-organization, Indore became the official capital of the Holkar kingdom and a British resident was stationed here. The Holkars themselves remained loyal to the British throughout, however in 1857 during the Indian Uprising their soldiers decided not to follow the rulers' example. Colonel Henry Durand, the British resident in Indore, severely misjudging the mood of the public and kept insisting that 'not a ripple' would 'break the calm which reigned in Central India'. Almost even as he was saying this, the soldiers rebelled. Not for long however, the leader of the Uprising Saadat Khan was captured within a few months and sentenced to death by the British. The later Holkar rulers, especially Tukoji Rao II (1844-1886) who built the first railway line and a hospital among other things, did much to modernize and beautify their kingdom. 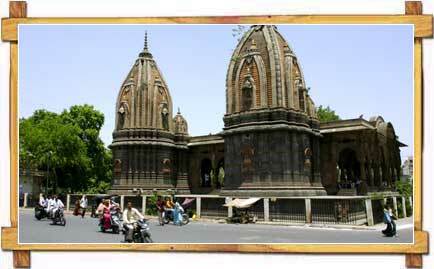 In 1947 when India became independent Indore joined the republic of India along with many other princely states. However as with all the erstwhile ruling dynasties, the present scion of the family Richard Holkar is still revered as a king by the people. He, along with his wife Sally Holkar, has done a lot of work in reviving the traditional arts of Indore, like the famous maheshwari saris and fabrics.